Start by placing the dumplings on a sheet pan in a thin layer to defrost for about 15 minutes. While the dumplings defrost, start working on your dipping sauces. Blend raspberries in a blender until they reach a puree, don’t overblend. Strain the puree through a mesh strainer over a small saucepan to remove any seeds. Place saucepan over medium heat and add sugar. Bring to a gentile boil while stirring and let boil for a few minutes. Mix the water and the cornstarch together in a small bowl and add to the raspberry mix. Keep stirring until sauce thickens and remove from heat. Pour into a dipping bowl. In a bowl, mix together the chocolate chips and the heavy cream. Microwave for 30 seconds, then remove and stir until sauce is smooth and creamy. 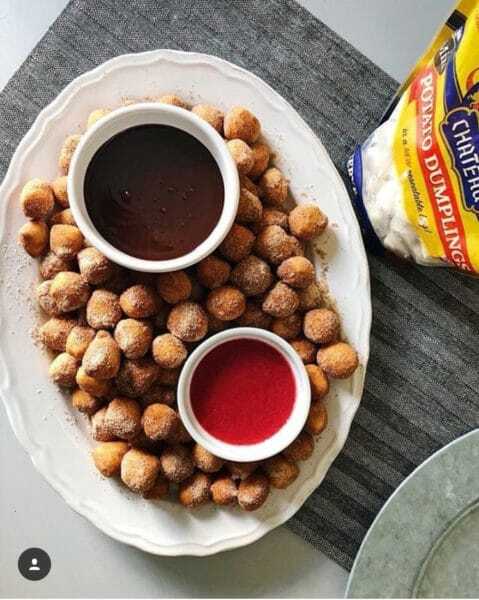 Pour into a dipping bowl. In a gallon ziplock bag, add sugar and cinnamon and toss together well. Set aside. In a heavy-bottomed pot, like an enameled cast iron pot, heat about 2 inches of canola oil until it reaches 350 F. Slowly and carefully add one third of the dumplings. Placing them in a slotted spoon or a skimmer then lowering them into the oil works well. Gently and carefully stir the dumplings as they fry to avoid them sticking to the bottom of the pot and getting burnt. Once the dumplings turn a golden brown color and are floating (about 2 1/3-3 minutes), remove from the oil and place on a paper-towel lined plate. Repeat with the remaining two-thirds of the dumplings. After each batch of dumpling has cooled for a minute or two on the paper towels, dump them into the ziplock bag with the cinnamon sugar mix. Once all dumplings are fried and coated, remove them with a slotted spoon onto a serving platter. Serve warm with dipping sauces. Enjoy!